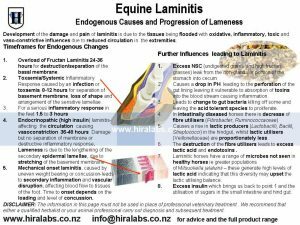 Laminitis, is a description of the effect rather than its cause. Which is an inflammation of the lamellar caused by a number of factors ie: physical damage, bacterial toxins (disease), metabolic conditions – EMS, IR & Cushing’s Disease – and diet. Nutritional imbalance can trigger an effect,ie: the feeding of excess NSC (non-structural carbohydrates, such as starch or fructans.) This generates high levels of lactic acid, which increases the absorption of negative factors from the hindgut. Why then are NSC implicated whilst structural ones (fibres) are not? The answer . It depends on the microbes in the gut. The common factor is the high ratio of tissues with oxidative, inflammatory, toxic and vaso-constrictive markers in the extremities (legs hooves) partly due to reduced circulation, compared to the body core. What makes some horses more Prone to Laminitis? This gives to a rise in lactic producers (Lactobacilli, Bacilli, Streptococci) in the hindgut, whilst lactic utilisers (Veillonellaceae) remain constant. Laminitic horses appear to have a higher diversity of hindgut microbes than “normal” horses. Ie around 20% greater diversity of species which would include microbes that work against the beneficial fibre digesters. Research shows that there were large differences in the numbers and diversity of microbes common to laminitic and normal horses, but laminitics also had far greater populations of two Clostridiales genera. Take away point: increase the ratio of fibre to NSC and high sugar grasses. Is a condition where circulatory changes cause inflammation and congestion of the sensitive laminae of the feet. A number of factors cause changes to animal’s blood pressure causing it to rise, leading to an increase of blood supply to the feet. However constriction of blood vessels supplying laminae reduces blood circulation which then will deprive the area of oxygen and nutrients causing inflammation. 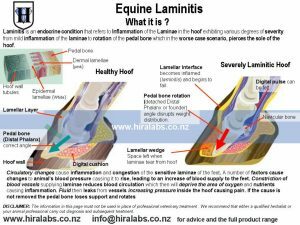 Fluid then leaks from vessels and the increase in pressure inside the hoof causes pain. If the cause is not removed tissue dies causing the pedal bone to lose its support which in turn causes it to rotate. This is an irreversible condition. 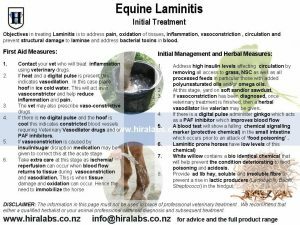 Laminitis is essentially an endocrine condition so while we address hoof integrity,we also recommend a range of things that should be done. The main objective is to lower the blood glucose levels and calm the insulin response. Primarily it is a condition where circulatory changes cause inflammation and congestion of the sensitive laminae of the feet. A number of factors cause changes to animal’s blood pressure causing it to rise, leading to an increase of blood supply to the feet. However constriction of blood vessels supplying laminae reduces blood circulation which then will deprive the area of oxygen and nutrients causing inflammation. Fluid then leaks from vessels and the increase in pressure inside the hoof causes pain. If the cause is not removed tissue dies causing the pedal bone to lose its support which in turn causes it to rotate. This is an irreversible condition. Research shows that there is a very strong association between the development of obesity, metabolic syndrome and the risk of developing laminitis. Unlimited access to lush grass or clover. Eating large quantities of feed. Access to off-limits feed bins. Toxaemia (blood poisoning) where bacterial toxins have been absorbed. Concussion or prolonged exercise on hard ground. Incorrect trimming or uneven weight bearing on limbs. Heat in the hoof with a reluctance to move. Standing with the front legs angled towards the front. In some cases cloudy urine. 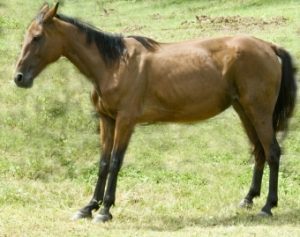 Horses that have had previous bouts of laminitis may have concave horn development and /or horizontal ridges on the horn. In more severe cases the sole may have collapsed making the hoof flat and susceptible to stone bruises. Restore normal blood flow to foot by dilating blood vessels. Address blood vessel integrity thus reducing leaking of fluids. Look at restoring condition of horn development. Move horse to a yard or stable which has a thick bed of wood shavings. Cold water will provide temporary pain relief at the acute stage but do not prolong this as it will cause further undesirable constriction of blood vessels. Bathing with warm water once the heat has subsided will dilate blood vessels. Reduce feed consumption. Provide water which will have a tea of cleavers added to it to flush kidneys. Gingko leaves will help improve blood circulation to the laminae. Herbs like Echinacea and olive leaves will enhance the immune system and address bacterial toxins in blood. If pedal bone is stable, short periods of walking on soft ground to encourage circulation. Shorten long toes and rasp the front of hoof wall until it is parallel with the pedal bone.